Season the chicken as desired. 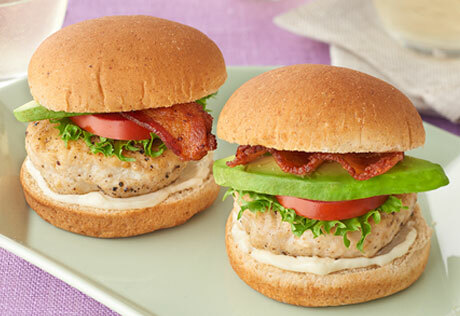 Shape the chicken into 6 (2 1/2-inch) mini burgers. Heat the oil in a 12-inch skillet over medium-high heat. Cook the burgers for 10 minutes or until browned on both sides and cooked through. Spread 1 teaspoon mayonnaise on the bottom half of each bun. Top each with 1 burger, 1 leaf lettuce, 1 slice tomato, 1 slice avocado and 1 piece bacon. To grill the burgers instead of cooking in the skillet, lightly oil the grill rack and heat the grill to medium. Grill the burgers for 10 minutes or until cooked through, turning them over once halfway through the grilling time.